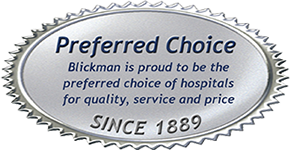 Blickman is the preferred choice for superior craftsmanship, durability and service in stainless steel surgical and sterile processing department equipment among hospitals and healthcare systems. For more than a century we have maintained our commitment to providing "made to last" equipment. To contribute to better patient safety and outcomes, through engineering, design, manufacture, and sale of stainless steel surgical and critical care equipment and related products. To direct our growth in the areas of surgical and critical care; to gather people and facilities that tend to augment these areas; to continuously build on these areas through education and sharing expertise. To strive without reserve for the greatest possible reliability and quality in our products; to be the unsurpassed standard of comparison and to be recognized for our ongoing dedication, honesty, integrity, and service.